My 10 year old has been really enjoying the Arckit architectural construction kit recently. 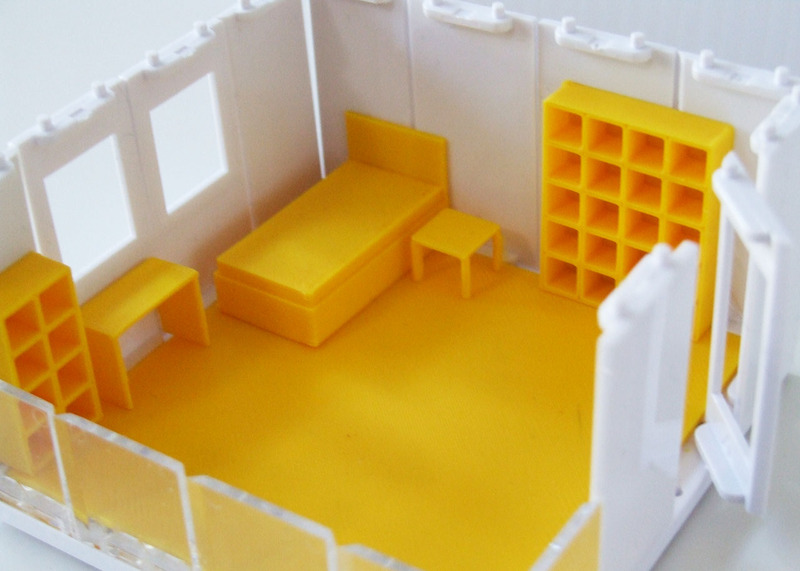 We tried a bit of 3D modelling and 3D printing to create floors for internal rooms in Arckit models. Next we thought we'd have a go at creating some furniture. 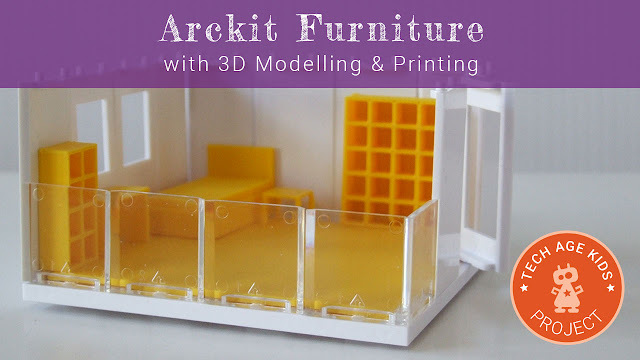 Putting furniture inside an Arckit model helps you to understand the scale and adds detail and interest. We started with an IKEA Kallax cube unit that we own as it's quite a simple structure and we could quickly look up the measurements on the IKEA website: 1470 x 770 x 390 mm. Arckit is at a scale of 1:48 so the numbers just need dividing by 48 to get the dimensions that we want to print with. This time we tried BlocksCAD. BlocksCAD is a drag and drop 3D modelling tool with concepts that match those in the OpenSCAD tool for creating 3D models programmatically. I've used OpenSCAD so I found this quite natural to use. My partner uses it a lot so it's a good thing for the kids to learn. We decided that he would make all the flat panels the same depth (5cm) as that was easier and they would be quite thin to 3D print anyway. I was amazed at how quickly he worked out the locations and dimensions of the various parts. I couldn't keep up. I just had to explain the effect of centering the cuboids around the current coordinates. I can just about perform calculations mentally as fast as he can, but I couldn't work out which calculations to perform anywhere near as quickly! He very rapidly had a 3D model of the IKEA unit on the screen. We found that it was easy to wrap a scale operator around the whole thing so that he could work with real world dimensions. An alternative way of modelling the bookcase would have been to create a large cuboid and then remove a cuboid for each shelf, but my son was happy with his way of doing things so I let him get on with it. BlocksCAD allows you to export an STL file for printing or an OpenSCAD file. This is really useful for eventually moving on to OpenSCAD programming. The first model we printed had a small mistake in, my son quickly fixed the calculations and we printed it again. The model took about 14 minutes to print. You could model the width of the shelves and uprights more accurately but this was good enough for our purposes. My son found it easier to model the bookcase standing upright and centered around zero. For 3D printing it's better to lie the model flat. The translation can either be done in BlocksCAD or in a 3D modelling slicing tool. My son decide he wanted to create a bedroom for himself by adding more furniture. 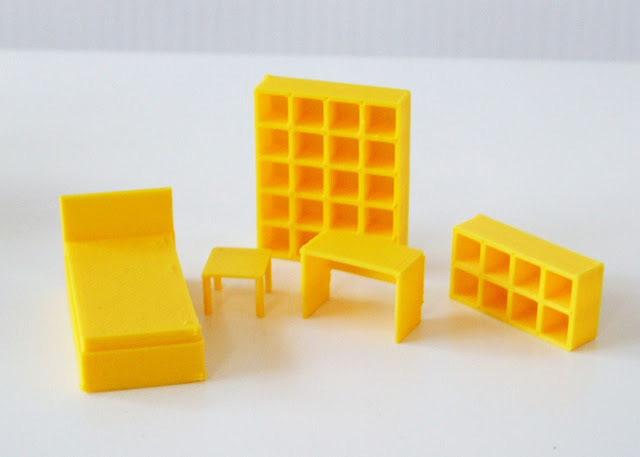 We also modelled some other simple items: a bed, a desk and a small table. 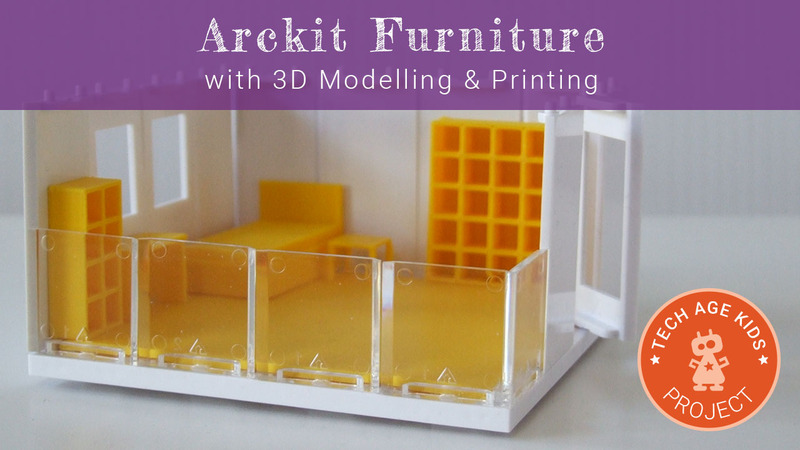 The furniture stands nicely in an Arckit room on one of our 3D printed floors, whether freestanding or against the wall. This would definitely be a practical way to plan the layout for a new room.